As hundreds of first-year students move into campus residence halls this weekend, they will be greeted by enthusiastic volunteers and a busy schedule of orientation activities designed to create connections within the campus community. As first-year Emory students move into campus residence halls this weekend, they will be met with a busy schedule of orientation activities intended to welcome them to the Emory experience. In addition to time-honored traditions like the Coca-Cola Toast, members of the Class of 2020 will discover a variety of ways to begin forging deeper connections within the campus community — from learning about service opportunities and meeting with faculty and staff to finding their own voices in helping shape the campus culture. But beyond the excitement of creating a new campus home, orientation represents an important, foundational time for new students, says Michael Toney, director of orientation for the Office of Undergraduate Education. “Orientation is really laying the groundwork for their experience at Emory — an introduction to what you can get from your time here,” Toney explains. “And we’re here to help students establish those connections with peers and faculty and staff. On Saturday, more than 1,300 first-year students, plus transfer students, will begin the four-day orientation experience at Emory’s Atlanta campus — an introduction to life at Emory that ranges from moving into residence halls and meeting with academic advisers to vaccine clinics, ice cream socials, exploring academic interests, campus tours and peer discussions. Returning Emory students and continuing students from Oxford College will move in on Sunday. Meanwhile, Oxford College welcomes more than 500 first-year students; most will move in and begin new student orientation on Friday, while new international student orientation runs throughout this week. Sophomores at Oxford move in on Tuesday, Aug. 23, although some arrive earlier to help lead orientation activities. “Our student leaders bring an immeasurable amount of excitement and love for Oxford to orientation. Families and new students arrive on campus and can immediately feel the welcome and warmth — and it's not just the August heat,” says Rhiannon Hubert 05Ox 07C, Oxford's assistant dean for Campus Life and director of student involvement and leadership. Although new-student orientation activities on both campuses formally conclude Tuesday — the day before classes officially start — Toney looks at it as just the beginning, an exercise in helping students take some solid first steps into campus life. For incoming students, the orientation experience actually began months ago, with a series of online training modules, a weekly newsletter, course registration, and introductions to fellow classmates and campus programs via social media. It’s all important in fostering a sense of belonging in a new community, which can be critical in building a successful college experience, says M. DeLa Sweeney, director of social justice education and interim director of Emory’s Office of Multicultural Programs and Services (OMPS). Bienvenidos: Centro Latino at Emory, 1-2:30 p.m., Dobbs University Center. Sponsored by OMPS, this gathering allows incoming Latin American and Hispanic students and their families to network and socialize while learning more about the Emory experience from students, alumni and staff. Building Leaders And Cultivating Knowledge (BLACK): Emory Black Student Union, 2:30-3:30 p.m., Dobbs University Center. This event provides Black, African-American, African and African-heritage students and their families a chance to connect with current Emory students and staff while learning more about Emory. First at Emory: Eagle’s Landing, 3-4 p.m., Dobbs University Center. First-year students who identify as first-generation college students and their families are invited to meet with other current first-generation students, faculty and staff members. Through Campus Life’s Creating Emory program, first-year students will also engage in group dialogues to heighten awareness around issues of diversity and inclusion, integrity, and interpersonal violence — conversations intended to help shape the campus culture, Toney says. 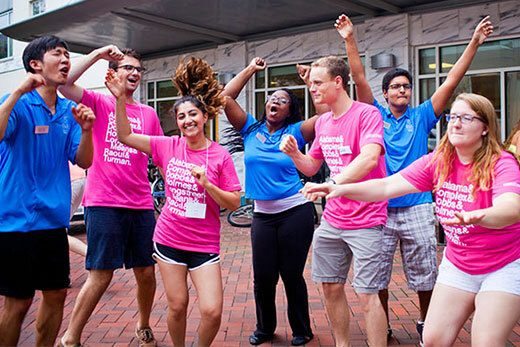 For some new students, Emory pre-orientation programs will bring them to campus even earlier this week. International first-year and transfer students and their families arrive Wednesday, Aug. 17, for the iSEE (International Student Experience at Emory) program, designed to help with a transition into the Emory community prior to new student orientation. Crossroads, a signature first-year student program sponsored by OMPS that focuses on community-building among Emory’s diverse incoming student population, will bring in students on Wednesday for a pre-orientation retreat designed to support the transition to Emory by providing opportunities to build meaningful relationships while developing an appreciation for diversity. SOAR (Student Outdoor Adventure Retreat) invites first-year students to meet other freshmen and learn about Emory from upperclassmen on a three-day outdoor adventure immediately before orientation. Trips have included backpacking, kayaking and whitewater rafting adventures. STEM Pathways also provides a supportive community to first-year natural science and mathematics students who are the first generation in their families to attend college or in identity groups underrepresented in STEM fields. The program launches Tuesday, Aug. 16.